I'm an Auburn alumni and tailgate under the shadows of Jordan-Hare stadium at every home game during the fall with the self proclaimed Auburn Stage Crew Alumni Association. For the 2005 Iron Bowl my father in-law and I rolled on to campus at 5:00 a.m. to get the grill started for the 12 whole chickens, 6lbs. of sausage and vat of brunswick stew we cooked for the 100 or so folks at our tailgate. The game was at 2:30 p.m. Needless to say we ran out of food. Fast forward to the 2006 Auburn Georgia game (The oldest rivalry in the South) and you have a recipe for a 4:00 a.m. grill start time - 18 whole chickens, 4lbs. of sausage and sides you wouldn't believe. Again feeding about 100 people. This year we dumped the 36" TV for a 10'x10' screen and projector to watch the other games while we eat, drink and be merry. We also had an addition to almost all of our tailgates this year, it was our 9 month old daughter's first Auburn/Georgia game, she only missed two games all season. While the outcome was not in our favor the tailgating was top notch. After 14 hours of being on campus it was time to head back to the house. We're already planning for next season. WAR EAGLE! from Nick in Atlanta, Ga. I've been to other NFL stadiums for games and was very disappointed in their versions of tailgating; some didn't have any at all. I'm a Chiefs season ticket holder and am very proud to be thru the good times and bad. 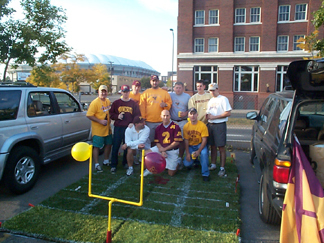 Tailgating is such an important part of the whole football game experience. The discussion of what to bring and what we're going to be cooking starts a week prior to the game. The head count goes from 10 to 12 to 25, and that's just the ones who let us know they're coming (we've had as many as 60 people at 1 time). We have to make sure the beer taps on the inside and outside of the bus are in good working order and that the satellite dish is hooked up, and make sure the air conditioning/heat is working properlyâ€”there are times when you want to be really comfortable. We leave our house at 7:30 am (for noon games) to pick up our passengers so we can be at Arrowhead when the gates open. We take our usual spot in parking lot D and the party begins. What to do before the game? There's watching the pre-game shows on TV or listening to it on the radio, as well as listening to music blaring over our neighbor's stereo to get us more into the football mode. Did I mention countless appetizers? 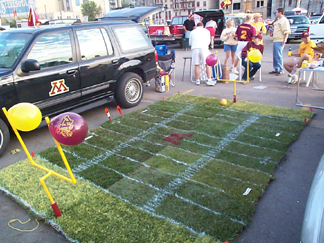 There are mini football games happening and most certainly a few washers games going onâ€”if you're from St. Louis, you know what I'm talking about. Of course, during all of this you look around you and all you see is a haze all over from the grills and the fabulous smell from all of the different foods. There's so much laughter and camaraderie; everyone talks to each other and has a great time, whether you're for the Chiefs or not. Its fun to give the fans of the opposing teams a hard time, but its all in fun and the ones who come in from out of town return because they enjoyed the experience so much. 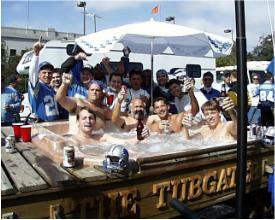 There are people who come to each and every game, just for the tailgating; they don't even have tickets to the game!!!! 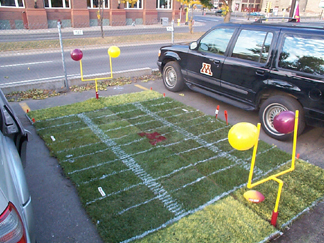 Once the game is over, the tailgating starts all over again. Our day at Arrowhead ends around 4:30 pm. 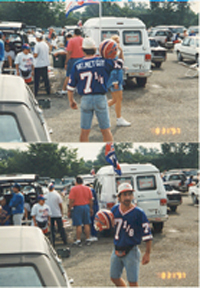 I am a huge BILLS fan and attend about half the games each year. I am a season ticket holder. I also have season tickets to the New England Patriots, since my brother lives about 10 minutes from Gillette Stadium in Foxboro. Several years ago, early 80's, we had a huge group to see the Pats and Raiders play at Sullivan Stadium in Foxboro. When we got to the game and began setting up the tailgate party...we were surprised to find out that my brother had left two coolers of food at his house, all we had was one pack of hot dogs for 15 people. Ever since then we have given an award, out to the new person in the group. It's called "The Silver Burger Award" and it's on my seats in Foxboro. Other tailgaters always amazed when we present the award, which is a burger (uncooked) wrapped in foil. Who knows who will receive the 2003 award?? If you're a Pats fan it could be you!!! GO BILLS!!!! At Youngstown State University we begin at 7am cooking the usual breakfast menus of eggs, sausage, bacon, ham, home fries and toast. As soon as we finish we begin the lunch menu with any thing from subs and pizza to deep fried turkeys and stuffed hot pepper with sausage or on cold fall days home made soups of all kinds. All of this is great but best part of tailgating is the socializing and fellowship. We especially enjoy hosting the opposing teams fans who have traveled to support their team. This year we had a great time with the fans from McNeese State. We are looking forward to our visit to their house in 2004. All who come to share our tailgate leave as friends....GO YOUNGSTOWN STATE UNIVERSITY PENGUINS! 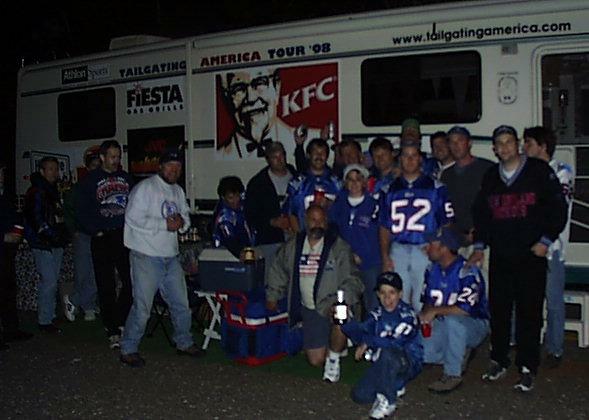 I've attended 39 Buffett concerts and have been tailgating at Buffalo Bills games for 17 straight years. Have only missed 5 games in that time. 2 preseason games and a few others because I was stuck in a airport or something. I won't let anyone else buy the meat or cook it's got to be done right you know!!!. For Bills games we always cook the opponent (Dolphin steaks when we play Miami, this year I will season with a lot of Sage, he's their new backup QB, Sage Rosenfels, ironically the son of one of my sales reps, Lamb when we play the Rams, tenderloin of bear when we plan the Bears, tenderloin of colt when we play the Colts, tastes just like Beef., Cornish game hens when we play the Flacons, etc.). About twice a year I do a standing rib roast (prime rib) after getting to the parking lot early so it has lots of time to slow cook. The best tailgatin' I've seen is at the Coca Cola 600 NASCAR race in Charlotte, N.C.. I'm sure that half of the annual 150,000+ fans tailgate. We have seats in Turn 2 and park in the field behind the track. That's where the campgrounds are, (looks like the old pictures of Woodstock) there' nothing but tents as far as you can see. And those people know how to have a good time. If you want a good spot, get there early (7:30 a.m.). The race starts at 6:00 p.m., so you have lots of time to relax and cook up some outrageous food and slug a few libations. And the fans are the best. I think NASCAR fans get a bad rap. They're not all "good ol' boy beer guzzlers". I'ts always different and we always have a great time. So if you like NASCAR, you've got to try the Coca Cola 600. And the best part is, it's on Memorial Day weekend, so you'll have an extra day off work to recover...from Dino, a tailgater from Miami, Florida. My tailgating group is one of the best tailgates thatIi have ever seen...we started our little group just the two of us (Big Sal and Llittle Frank) over 17 years ago with a little hibachi and a two milk crates. Now we are over 60 people strong. There is no place I would rather be on Saturdays in the fall than Parking Lot 1 outside Byrd Stadium at the University of Maryland. The Terps' successes on the field haven't been too numerous in recent years, but that's never dampened the atmosphere around campus on gameday. Everything that's right about college football is on display at Maryland. Terp fans dressed in Red & White arrive early and raise the distinctive state flag high in the air. 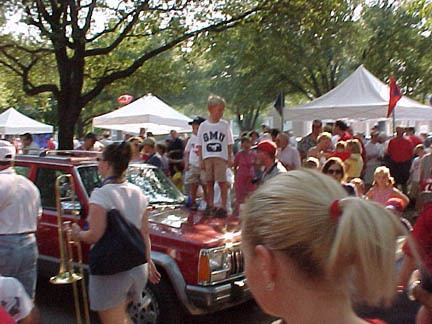 Cars, SUVs, and RVs are decked out with banners, pennants, and magnetic decals. Everywhere you look people are eating, drinking, throwing the ball around, and just having a good time. You can see the smoke from all the grills and smell some pretty appetizing aromas in the air, too. The marching band parades around the lot and when the team walks through the lot to the stadium, everyone lines up and cheers. The parties continue long after the game is over too. Maryland fans know how to party and are some of the friendliest people around. I was 19 years old when we did our first tailgate at Maryland in 1996. Back then we stood behind the car and ate subs from Wawa. Since then our tailgates have evolved and the number in our group has gotten larger. We're all season ticket holders now and enjoy sitting in comfy lawn chairs eating Brats-N-Beer hot off the grill. We even take our tailgate show on the road to enemy territories like Morgantown, W.Va., and rival schools in the ACC. And we didn't even go to school at UM--we're just Terrapins by birth! Win or lose, we have a blast every time. We're hoping fortunes on the field turn up with Ralph Friedgen coming back to coach in 2001. Needless to say, the Sept. 1 opener vs. North Carolina can't get here soon enough. Go Terps! ...Paul in Baltimore, MD "Friedgen's Legion: Follow me to Byrd Stadium." The Saguaro Aerostat Association's flying season is during the cooler months of the year out here...September through May mainly. A few times each month, up to 20-30 balloonists and their crews gather in Avra Valley (about 15 miles north of Tucson) and launch their balloons at daybreak (yes, it's often cold at the crack of dawn, let me tell you, even in the desert). After an hour or so of flying, the balloons are packed up and all head back to the launch site for TAILGATE extraordinaire! Saturdays in the fall in Baton Rouge, the fans are cooking all those Cajun favorites. Nothing can top a Saturday and Saturday Night in Tiger Stadium. Best Tailgating fans in the country and that goes for the visitors too. They really get into the spirit!...Randy from Louisiana.